I believe the basis of our Christian faith relies on two questions… “Who is God” and “What is truth?” Yes, our faith is based on a personal relationship with Jesus Christ – believing that He died and rose again for our sins – but until we can answer these two questions from a Biblical perspective, it is impossible for us to experience an authentic relationship with Christ. God and truth have become relative in today’s society. In other words, we have created our own gods and designed our own truth. About a year ago I surveyed a group of high school students in preparation for a series we were doing. I found that our lack of understanding of who God is and what is truly true has tainted our view of Christianity itself. Today’s younger generations use words like awesome, amazing, and big to describe God. Is that seriously all God is to us? We have not completely thrown out words like holy, just, gracious, and sovereign to describe God, but much of Christianity today does not fully understand God’s true character. We do not spend time with Him, so we do not know who He truly is. Today’s teens spend hours upon hours playing video games, stalking friends on Facebook, watching YouTube videos, and playing sports, yet they lack the desire or passion to get to know who God truly is. A true understanding of an authentic relationship with Jesus Christ must begin with a grasp of who God is! Anyone of us can say we “know” someone. But do we really know them? Could we call them up and be like… “Hey bro…let’s go to the movies.” Name a professional baseball player and I could tell you who they play for and what position they play (I dare you to test me on that one.) But I cannot think of one baseball player that I know well enough to invite over to my house for dinner. For many of us, it is the exact same scenario when it comes to knowing God. We think we know Him, but reality is we only know something about Him that we heard in Sunday School or on TV. Our overwhelming response must be… “NO!! !” We all know the words of Jesus in which He says, “I am the way, THE TRUTH, and the life…” He does not say I am A truth, instead Jesus says, “I am THE truth!” One of the overwhelming responses within the survey I did with high school students was that truth is simply “not lying.” I believe truth goes way beyond not telling a lie. It is living a life of Biblical integrity and Christlike character. It is living out our authentic relationship with Jesus Christ on a daily basis. We must not avoid the truth God has placed before us in His Word. As much as we would like it to be, truth is not relative. 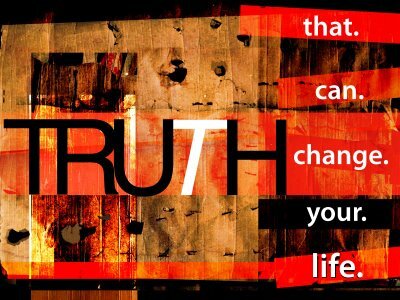 Truth is not about accepting the lies of the world as other people’s truths. Instead, it is about sharing the story of who God is with the world. The one aspect we must not leave out though is love! We must display humility, love, compassion, and forgiveness while sharing truth with those we come in contact with! My prayer is that I never lose sight of who God truly is and what is truly true and really real! As Autumn and I continue living out exactly what God has for us, my prayer is that our kiddos see the truth of who God is shining in and through our every word and action. God has given me the responsibility and opportunity to share truth with students every day! I pray we begin seeing a generation that not only understands who God is on a personal level, but are also not afraid to stand for the truth of His Word! What are you doing to instill the truth of God’s Word and a relationship with Him into your daily life and into your ministry?